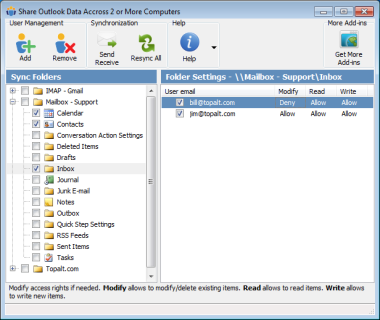 Automatically share Microsoft Outlook folders on multiple PCs in an easy way. No Server is required. Share all types of folders (calendars, contacts, emails, journals, notes, and tasks). Just add email addresses which should receive the folder and you are all set-up. No extra work is required. We know that syncing folders can be a hassle, especially when it’s done manually, Altsync solution provides a simple way to sync everything in one click across 2 or more computers. Altsync isn’t just limited to one type of folder, in-fact - Altsync allows you to share all types of folders; including calendars, contacts, emails, journal and more. There is no server required - Altsync works through email. It’s one click and you are done. 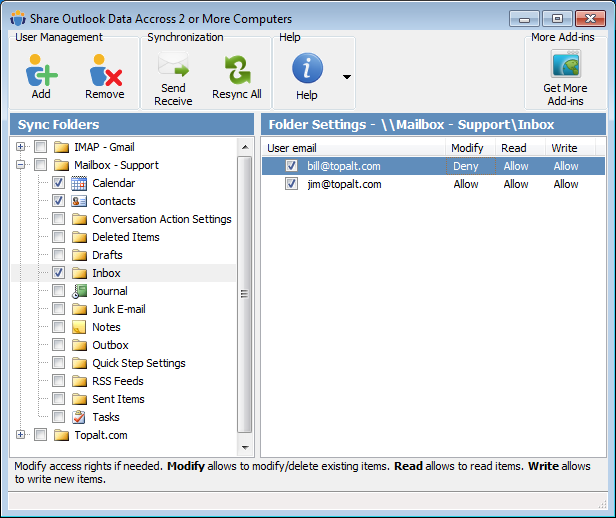 Add all of your email addresses from the computers you want to sync with and you will receive the folders - it’s really that simple. You are not only limited to sharing folders with yourself as you are able to share with anyone - with just their email address. Have the same Outlook calendar and contacts on your Desktop and Laptop. Share your Outlook calendar with family members. Share your Outlook contacts with colleagues. No server required. Works over email. Works with all types of folders (calendar, contact, email, journal, note, and task). You can try Altsync for free.